Have you ever felt that the ‘average return’ everybody talks about, is not actually what you are getting from your investments? If that is the case, then you are not alone. It is a common phenomenon and true for most people, that their actual returns will be different from what the average-return-talks tell. It is mainly because of the changing nature of the market performance over different time frames under consideration. Let me explain it with a few simple examples. 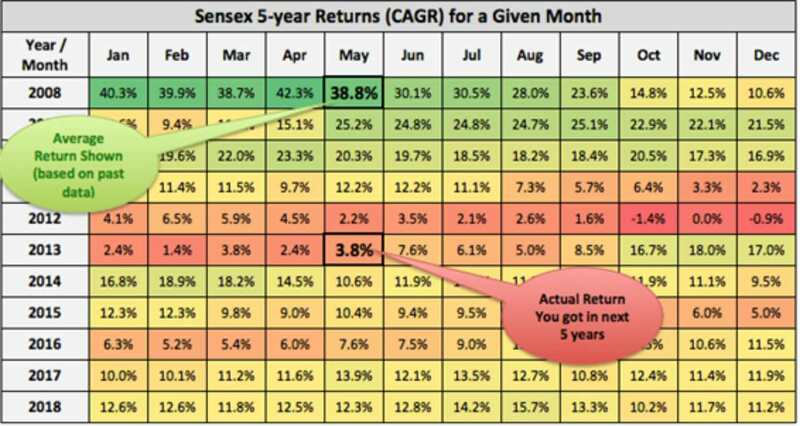 As of December-end 2018, what has been the return for Sensex in the last 5 years? *(i.e. 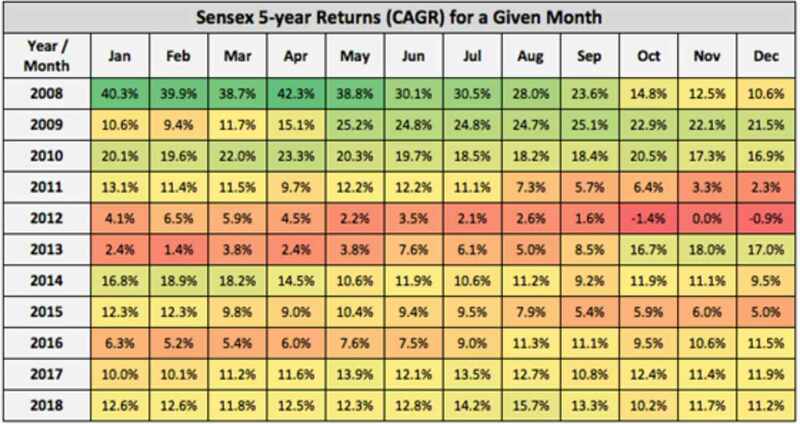 5-year CAGR for Sensex having moved from the level of 21,170 in December-2013 to 36,068 in December-2018). This means that had you invested in December 2013, the average annual returns you would have got by December 2018 would have been 11.2 percent per annum. But, this is one instance of a 5-year return. And does it mean that you will get this kind of return in any or all five-year investment periods? The last cell (bottom-right-most) of the grid shows the return of 11.2 percent — the one which we discussed earlier (December 2013 to December 2018 average returns). But as it is clearly evident, the actual five-year return that you got in past was dependent on when you started. – If you invested in July 2012, the five-year return you got by July 2017 was +13.5 percent. – If you invested in April 2011, the five-year return you got by April 2016 was just +6.0 percent. – If you invested in October 2007, the five-year return you got by October 2012 was a poor -1.4 percent. – If you invested in January 2003, the five-year return you got by January 2008 was a superb +40.3 percent. And what if we took the average of all these rolling five-year return periods? Then, in the last 10 years, we get an average five-year CAGR of 12.9 percent per annum. So, it is very easy to look at any of these long-term averages and make sweeping conclusions — like you will get 12 percent average annual returns if you invest for five years. Or many people may draw out conclusions based on where the latest five-year average returns stand. But that is not the right way to set expectations. Suppose it is May 2008 and you are an investor looking to invest some money. You have been shown that the average return in the last five years (between May 2003 and May 2008) is 38.8 percent. This will make you happy and no doubt eager to invest. But, when you invest in May 2008 resolving to remain invested for the next five years, the phenomenon of average return changing to actual return occurs. That is, fast forward to May 2013 (five years later). The actual return that you got in last five-years is just 3.8 percent. What this means is that the average returns themselves fluctuate depending on the period under consideration and when you start those periods. In more statistical terms, it is about standard deviation — a measure of how your returns will deviate from the stated average figure. And as we near the end, let us address another related aspect. Many people read statements like ‘average 15 percent annual returns in five years’ and believe that they will get the same returns from their Systematic Investment Plan (SIP) investments too. But, this is not necessarily true. The table shared earlier shows point-to-point return of one-time lump sum investments and not the returns of SIP investments. And this is an important difference to understand. In SIPs, you make multiple investments at different points (every month). 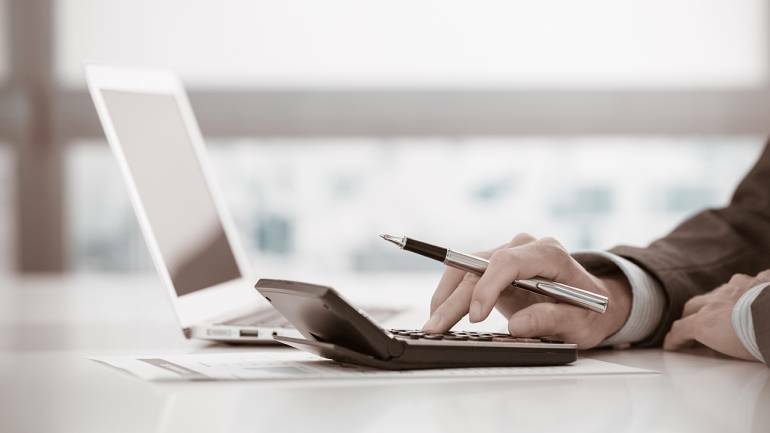 This effectively means that each investment instalment has a different investment period and return. So, the actual SIP returns will differ from the average returns and the point-to-point lump sum returns cannot exactly be compared with SIP returns. Generally speaking, never consider average return figures in isolation. Try to find out how much the actual returns will deviate from the average ones. That is the only sensible way to get some approximation of what actual return you might get. Always view the average returns figure for what they really are (i.e. approximations around which the actual returns move around) and not as some sort of guarantee. Only then you will have a realistic view and reasonable expectations from your investments.